Tanning is something I only really started doing last year. Now, I don’t mean lying out in the sun and baking, or using those awful cancer-giving death beds, but a tan that comes in a bottle. The best sort, I think. Getting a tan that’s as neat and natural looking as possible is a bit of a challenge, but I seem to have got myself into a routine so I thought I’d share! Shave | Tan doesn’t apply as nicely when you can’t be bothered to shave your legs. I’m not being all anti-feminist here, but it’s the truth. It sticks around the hair follicle and it’ll probably look quite blotchy. 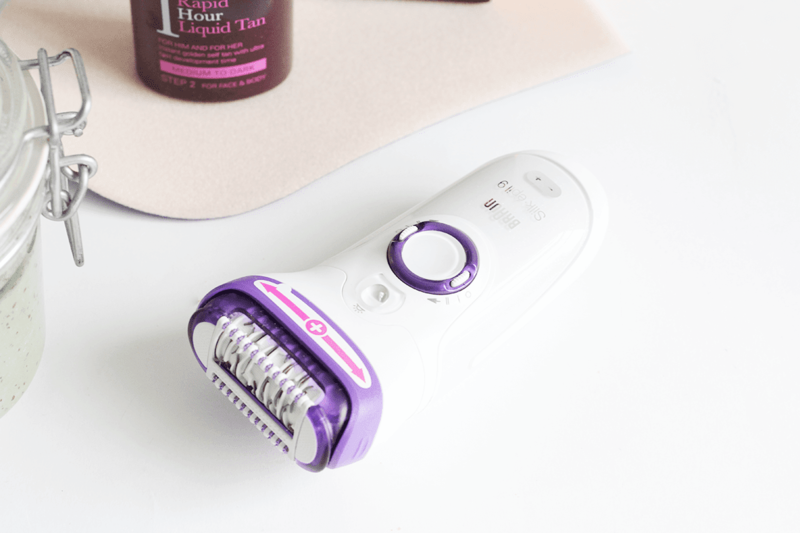 I’ve started epilating mine with the Braun Silk-Epil 9 and it works like a dream. I’ll admit I was very nervous before using this, as I quickly tested it on my arm and it hurt, but once I got over myself a bit, it really wasn’t bad at all! Pulling your skin tight and going as slowly as you can means a) it barely hurts and b) you’ll be getting all the hairs in one go, so you won’t have to redo that part. I did my legs over a week ago and they’re still silky smooth and, apparently, that feeling can last up to four weeks! I’ll take 15mins of mild discomfort for only shaving once a month – amiright? Exfoliate | Such an important step as you don’t want tan clinging to dry patches and dead skin that needs to be buffed off! 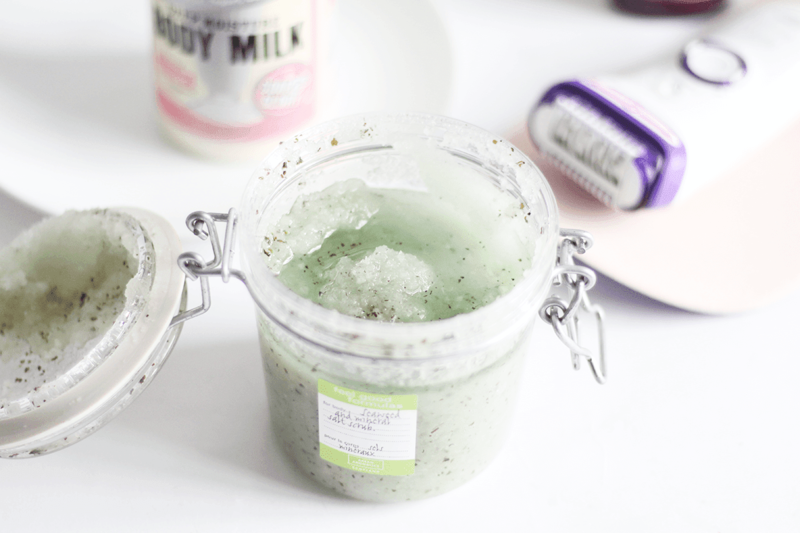 For this I love those scrubby gloves or this tub of joy which is the Arran Aromatics Seaweed and Mineral Salt Scrub. 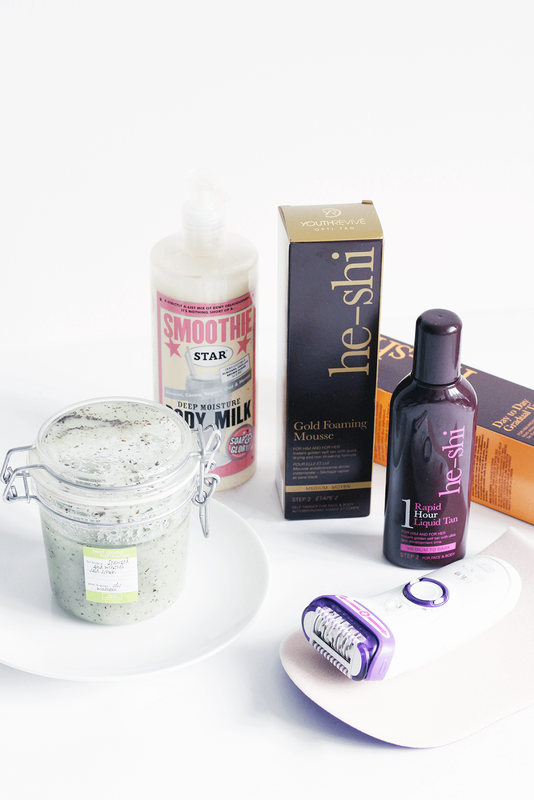 It really sloughs away any dull skin to make your body feel silky smooth. Tan applies so, so much better when you exfoliate first! Tan (With A Mitt!) | When applying tan, always apply it with a mitt as it goes on much more smoothly than it would if you used your hands (plus you won’t get dreaded tan palms when you’re using the darker stuff!). 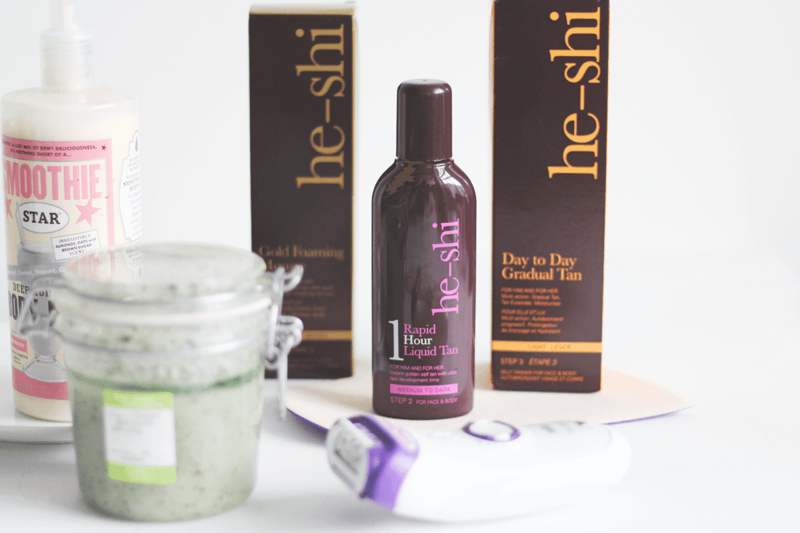 I adore the He-Shi 1 Hour Rapid Liquid Tan, as it’s literally foolproof, as well the others in the range such as the He-Shi Gold Foaming Mousse and the He-Shi Day To Day Gradual Tan for top ups! I apply mine in upwards, long strokes on my legs, arms and stomach, then fill in all the little bits elsewhere. Really work it into your knees, feet, elbows and between your fingers for a natural finish. Remember to wash it off the next day, as most tans take around eight hours to fully develop. Moisturise | Once you’ve rinsed all of the excess colour off, don’t exfoliate when you next shower as you’ll scrub your tan straight off. Instead, wash as usual and moisturise after each shower. I always use Soap and Glory Smoothie Star Body Milk, mostly because it smells divine, but also because it helps keep your tan for longer. After 2-3 days, start lightly exfoliating your skin so your tan fades evenly.